Dame Helen Mirren has named a new £300m cruise ship at Southampton - with the help of the Royal Marines. The Oscar-winning actress declared: "I wish the ship luck and love and calm seas on her voyages," to mark Ventura's official entry into service. P&O Cruises took no chances and employed two Royal Marines to ensure the traditional bottle of champagne broke against the ship's hull. Fireworks then lit up the sky in front of 1,500 guests. Ventura is due to leave on her maiden voyage to the Mediterranean on Friday. Royal Marines Alistair Barton and Carl Thurgood, of RNAS Yeovilton, in Somerset, were due to meet Dame Helen before abseiling down the ship's hull to perform the bottle-breaking ceremony. Sailors believe it is a sign of bad luck if the launching ceremony bottle remains intact on impact. It follows two bouts of bad luck during naming ceremonies, when the champagne failed to break: in December, the bottle failed to smash when the Duchess of Cornwall named the new Cunard liner, Queen Victoria. In April 2000, the champagne also failed to break when the Princess Royal named P&O Cruises's vessel Aurora. The ship later broke down on her maiden voyage, passengers were hit by a sickness bug and the ship suffered technical problems which prevented a voyage in 2005. Ventura, which can carry up to 3,600 passengers, was built at an Italian shipyard and arrived in her home port of Southampton on 6 April. The 115,000-tonne ship is equipped with five swimming pools, a 3D cinema, a Marco Pierre-White restaurant, rock-climbing facilities and a West End-style theatre. 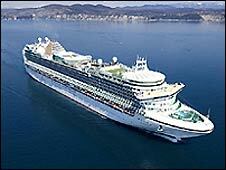 She has 12 bars and lounges, five shops, a library and casino and will be staffed by 1,200 crew. At 290m (317yds) in length, the ship is longer than Tower Bridge and has 15 passenger decks. Ventura's first season will be spent in the Mediterranean, the Atlantic and the Baltic before the ship sails for the Caribbean in October for her winter season.